I found a small amount of aran yarn in my stash and wondered what I could make. 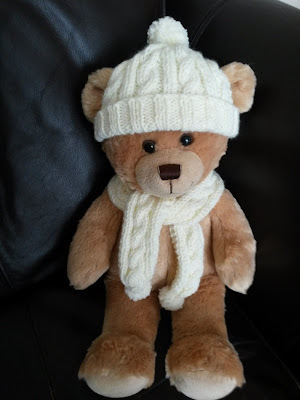 One of the Ravelers had mentioned that she would like a pattern for a hat and scarf for her daughters build a bear - so here it is. The hat is knit in rows and made in one piece for the rib, then divided into three pieces for the backs, and front to make a gap for the ears then joined again to shape the top. The hat has a back seam. 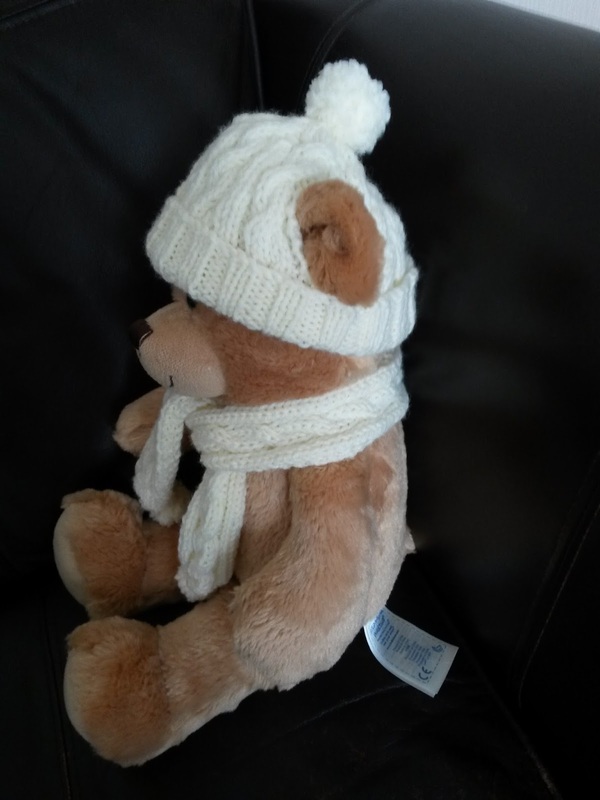 Bears ears are a bit tricky to fit a hat around but thankfully the knitting stretches around them ok. I don't much like the hats that don't have gaps as they can look a bit too bulky. These 6 rows form the cable pattern. Repeat pattern once then repeat rows 1 and 2. Leave sts on holder. These 6 rows form the cable pattern. Repeat pattern once, then repeat rows 1 and 2 Leave sts on holder. Fasten off yarn leaving a tail, thread yarn through remaining 7sts and secure with a few sts continue to sew back seam. These 6 rows form the cable pattern. Gather each end of scarf.